In 2016, the PeoPo platform (www.peopo.org) continued to forge closer links between civic groups through the use of emerging Internet technologies, Internet programs, and various types of events. 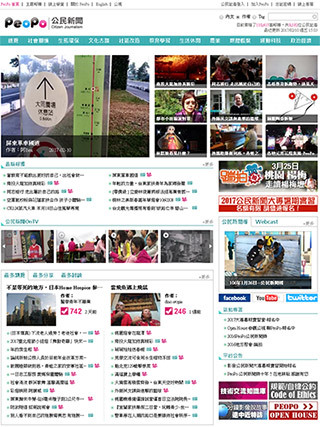 Over the past 9 years, the platform has amassed 9182 citizen journalists and produced over 110,000 reports, an impressive display of civic power in Taiwan. 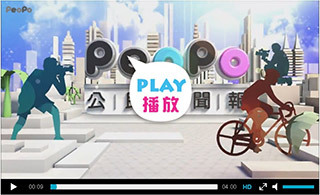 This year, PeoPo implemented high-quality comprehensive support for HD video upload and playback, ensuring audiences see clearer and that video content is more faithfully presented. In order to support the requirements of HD video uploads, relax file-upload restrictions, and encourage users to provide better video, the system now automatically provides SD and HD format options, thereby meeting the varying needs of users. Following a controversial event in June 2016, the platform has endeavored to keep pace with changes in the digital environment and better handle the day-to-day practicalities of operating the platform. To this end, PTS referred to the latest legal provisions and convened two citizen journalism consultation meetings, amending ‘PeoPo Citizen Journalism Platform Regulations for Users’ and the platform’s ‘Code of Ethics for Users’. The newly amended provisions will facilitate a smoother running of platform operations and also provide users with a clearer understanding on presenting material. At the same time, the Citizen Journalism Self-regulatory Committee was established to target possible violations of the platform’s user regulations or code of ethics. Convening quarterly meetings and providing recommendations on dealing with any issues that arise, the committee’s creation is an important step in ensuring that operating the PeoPo Citizen Journalism Platform proceeds smoothly and on track. By strengthening and improving PeoPo’s operational mechanism, PTS has safeguarded the principle of independent governance and the continued promotion of citizen journalism, providing a more diverse platform for dialogue in Taiwan’s civil society.